There are few things so quintessentially English as the Afternoon Tea. Dating back to the 1800s, it was invented by the aristocrat Anna, the 7th Duchess of Bedford, who wanted something to combat that ‘sinking feeling’ in the afternoon, after lunch but before dinnertime. On a day-to-day basis most of us will reach for a cup of tea and a biscuit around three o’clock, when the next meal feels just that bit too far away. Although we might not sit down to a full Afternoon Tea each day, something about the ceremony and tradition of a light meal and a drink keeps the institution alive. What started off as a snack and a cup of tea has evolved into a much grander and more creative affair. 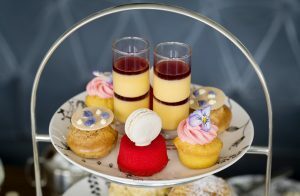 Champagne paired with intricate pastries, speciality teas with perfectly formed sandwiches and themed teas catering to all ages have all become part of the modern Afternoon Tea culture. Here at Swan, Shakespeare’s Globe, we have taken inspiration from another great British institution: William Shakespeare. Our Midsummer Night’s Dream Afternoon Tea, which has just received a highly commended award of excellence by the Afternoon Tea Awards, invites diners to explore the twists and turns of Shakespeare’s ethereal romantic comedy as they tuck in. Our afternoon tea is inspired by the stories of the play’s characters, so our guests are able to enjoy treats including the pea flower from Oberon’s love potion, mulberries from the lovers’ tree and apricots like the ones Titania feeds to Bottom. The tea is served on our bespoke crockery designed by Annika Wester that will whisk you away to a Shakespearean world of love, laughter and imagination. 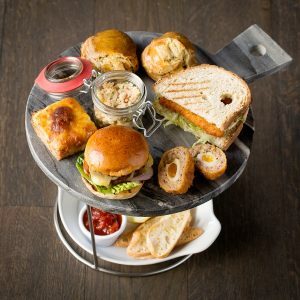 Our Gentleman’s Tea is perfect for those with a more savoury tooth or meatier desires. It swaps more delicate sandwiches for Beef slider and Scotch eggs, which are washed down with a tankard of Hobday Smoked Brown Ale. Perfect for gents — and ladies — looking for a more unusual, gutsy Afternoon Tea experience. Swan’s teas are overseen by our new executive chef Allan Pickett, and as with our main restaurant menu are built around the very best locally-sourced, seasonal British ingredients. Afternoon Tea is a special way to mark an occasion such as a birthday or anniversary, or a simple Saturday treat allowing friends and family to catch up while escaping the hustle and bustle of the city. Whatever kind of Afternoon Tea you choose, perhaps the reason why the mid-afternoon meal remains so firmly in our hearts is the opportunity it affords for spending good quality time with family and friends. Not a formal meal, but still decadent and occasion-filled, it offers afternoon chats, laughter and special moments as much as it does cups of tea and beautiful cakes. If you would like to book our Midsummer Night’s Dream Tea or Gentleman’s Tea you can get in touch here. Please let us know if you have any dietary requirements or allergies in advance.